entropion (entropion) - incorrect position century, when the free edge them together with eyelashes turned to the eyeball (Fig). 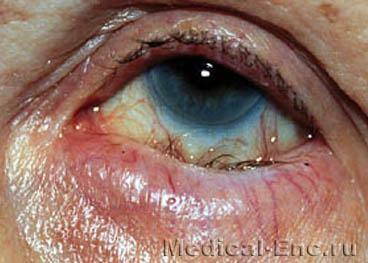 Entropion arises from the spastic contractions of the circular muscles of the eyelids is spastic entropion or scar wrinkling of the conjunctiva - scar entropion. Friction eyelashes on the cornea causing it damage up to ulceration. In spastic turning age treatment is aimed at eliminating the root cause (conjunctivitis, keratit, and so on)that caused blepharospasm. In resistant cases, and for scaring roll the century resort to surgical treatment (see Blepharoplasty).